There are many characteristics that define ajummas but their appearance is the one most easily identified. 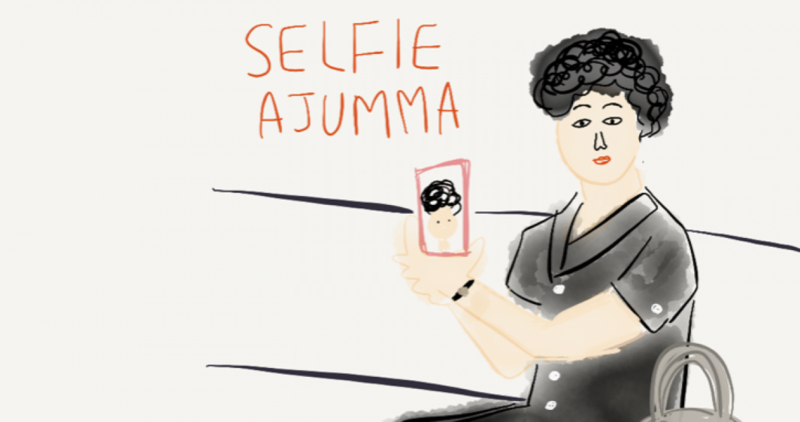 For example, if single women or men wear ajummorous outfits or have ajummorous hairstyles, their friends will say to them “you look like an ajumma!” However, while people categorise others as ajummas there is no exact or official definition for ajummas or ajummorous characteristics. Categorisation is based on pre-conceived views learnt through society and shared and reinforced continuously. While appearance is the most obvious characteristic by which people are identified as ajummas, I would like to tell you that being an ajumma is not limited to appearance but includes other characteristics. They are wives and mothers who take their roles very seriously and put great effort into supporting their children and husbands. They consider themselves the pillar supporting their family’s happiness and success. However do not imagine that self-sacrifice is their only pleasure. They know how to enjoy their lives. In this way I consider them superwomen. Posted on 18 Dec 2015 29 Dec 2015 by moon ajummaPosted in Smart Ajumma (English)Tagged ajumma, 아줌마, Korean women, smart ajumma, superwoman. Previous Previous post: 아줌마는 수퍼우먼이다!